196 pages | 26 B/W Illus. "For authors in the 'dismal science' of economics their results are surprisingly optimistic. For a book about the politics of food its content is surprisingly deep and meaningful. This book about political polarization unites people more than it divides them!" – F. Bailey Norwood, Oklahoma State University, USA, and author of Compassion, by the Pound and Agricultural and Food Controversies. 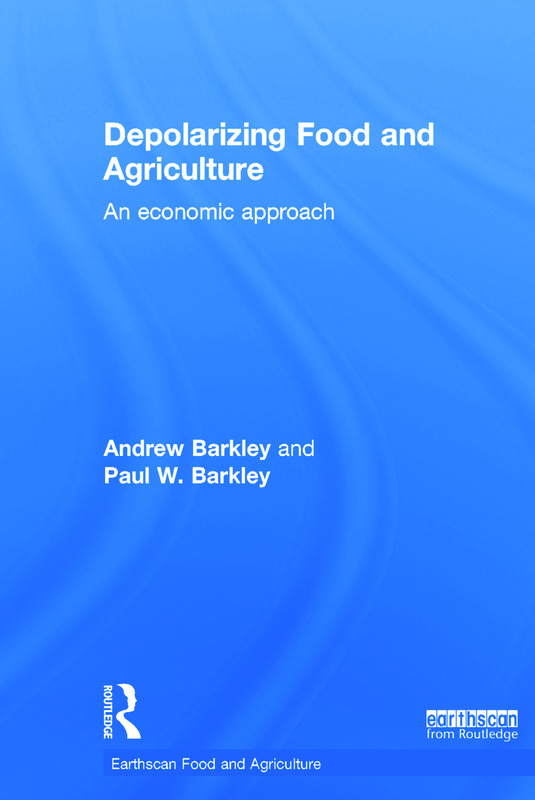 "Andrew and Paul Barkley provide a brilliant analysis of the various divisions and tensions that currently characterize modern agriculture. These tensions are put in the context of "polarization," which refers to the process by which opposing views become concentrated and are used to advocate very different beliefs and philosophies about agriculture. These concepts are pervasive in modern agriculture and underlie opposing views about the role of production agriculture, markets, and agricultural policy positions. The book should be an essential addition to the collection of professionals interested in agricultural development and policy. It will also be a very valuable text for use in agricultural economics and sociology classes." – Barry K. Goodwin, William Neal Reynolds Distinguished Professor, North Carolina State University, USA, and President and Fellow of the Agricultural and Applied Economics Association (AAEA). "When criticized on environmental or nutritional grounds, US farm groups are sometimes tempted to adopt a thickly-armored defensive posture. In this daring book, respected agricultural economists Andrew Barkley and Paul Barkley offer a persuasive alternative. Echoing Schumpeter's vision of creative destruction (naturally), but also drawing on John Stuart Mill and Nelson Mandela (more surprisingly), the authors argue for an open and understanding approach to contemporary food and agriculture controversies, eventually offering hope – as the title indicates – for depolarizing food and agriculture." – Parke Wilde, Associate Professor, Friedman School of Nutrition Science and Policy, Tufts University, Boston, USA, and author of Food Policy in the United States: An Introduction (Routledge, 2013). Andrew Barkley is Professor and University Distinguished Teaching Scholar in the Department of Agricultural Economics at Kansas State University, USA. Andrew teaches courses in the economics of agriculture and public policy. His research includes assessment of teaching and learning methods and the economic evaluation of the wheat industry. Paul W. Barkley is Professor Emeritus, Department of Agricultural Economics, Washington State University and Adjunct Professor, Applied Economics Department at Oregon State University, USA. Paul has made major contributions to the fields of rural (community) development and environmental economics. He is a Fellow of the Agricultural and Applied Economics Association.